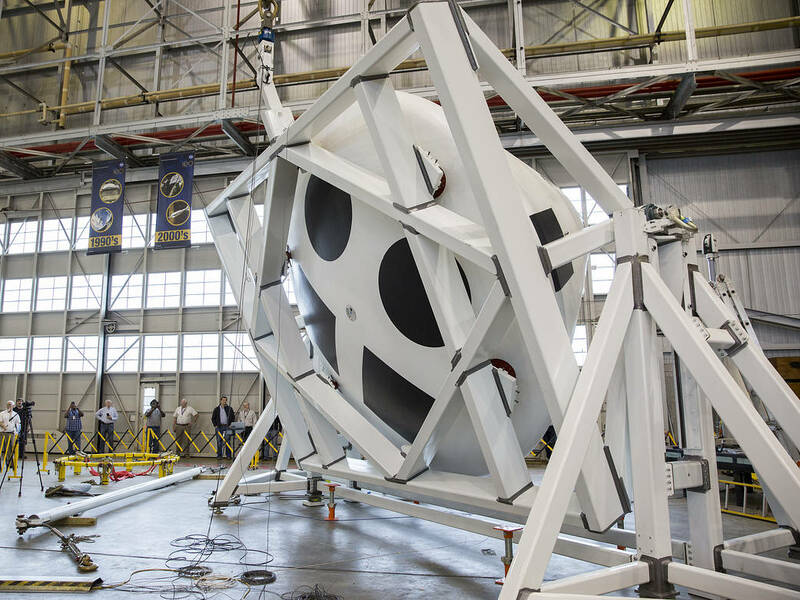 February 23, 2018 – Researchers conducted mass property testing of the Orion crew module for the Ascent Abort Test-2 Friday, February 16, at NASA’s Langley Research Center in Hampton, Virginia. The crew module, built at Langley, was lifted and rotated on its side to determine its weight and center of gravity, known as balance. To get accurate results during the uncrewed flight test planned for April 2019 at Cape Canaveral Air Force Station in Florida, this simplified crew module needs to have the same outer shape and approximate mass distribution of the Orion crew module that astronauts will fly in on future missions to deep space. The markings on the sides and bottom of the capsule used for the test will allow cameras to follow the spacecraft’s trajectory as well as the orientation of the spacecraft relative to the direction of travel for data collection. Next, it will be shipped to NASA’s Johnson Space Center in Houston where engineers will outfit it with the avionics, power, software, instrumentation and other elements needed to execute the flight test. This test will help ensure Orion’s launch abort system can carry astronauts to safety in the event of an emergency with its rocket during launch.